Can someone hand me a tissue, please? I think I'm tearing up...I'm so impressed with the fact that tissue companies are now really taking note of the importance of design. Have you noticed that lately? Some of the tissue boxes are actually really beautiful to look at and mesh so nicely with your decor. And why not? I'm surprised they didn't think of it sooner. From Puff's to Kleenex, tissue companies are really stepping up their game. 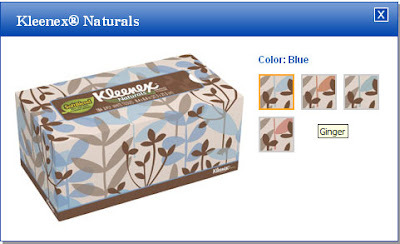 Kleenex now provides you the option to view the box type and design. Sweet! Both Puffs and Kleenex have also started a 'build your own box' program. An amazing pic i took of a circle around the sun a few minutes ago..check out it worth! I love the new design on your blog!